Garret Augustus Hobart (June 3, 1844 - November 21, 1899) was the 24th Vice President of the United States (1897-1899), serving under President William McKinley. He was the sixth American vice president to die in office. Hobart was born in Long Branch, New Jersey, on the Jersey Shore, and grew up in nearby Marlboro. After attending Rutgers College, Hobart read law with prominent Paterson attorney Socrates Tuttle. 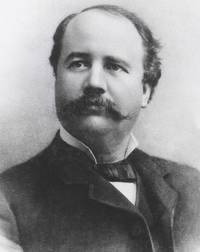 Hobart both studied with Tuttle, and married his daughter. Although he rarely set foot in a courtroom, Hobart became wealthy as a corporate lawyer. This webpage uses material from the Wikipedia article "Garret_Hobart" and is licensed under the GNU Free Documentation License. Reality TV World is not responsible for any errors or omissions the Wikipedia article may contain.